The first thing I do every morning is brew an Assam, Keemun or favorite blend-of-the-moment in my well-worn yellow Beehouse teapot (made in Japan and picked up by me at the Harney & Sons shop down in Soho.) Note that Sara Shacket of Tea Happiness also listed this cozy little number in her top picks! I have a slightly larger one in metallic gold that I sometimes use for parties (and am also completely indebted to my Zojirushi electric water kettle, which I set to 205 degrees every night, and change throughout the course of the day for brewing different kinds of tea. I steep a lot of oolongs when I’m writing). I still haven’t learned how to turn off the ditty it sings with every temperature change but my husband seems to have accepted that by now, and it’s grown on me. 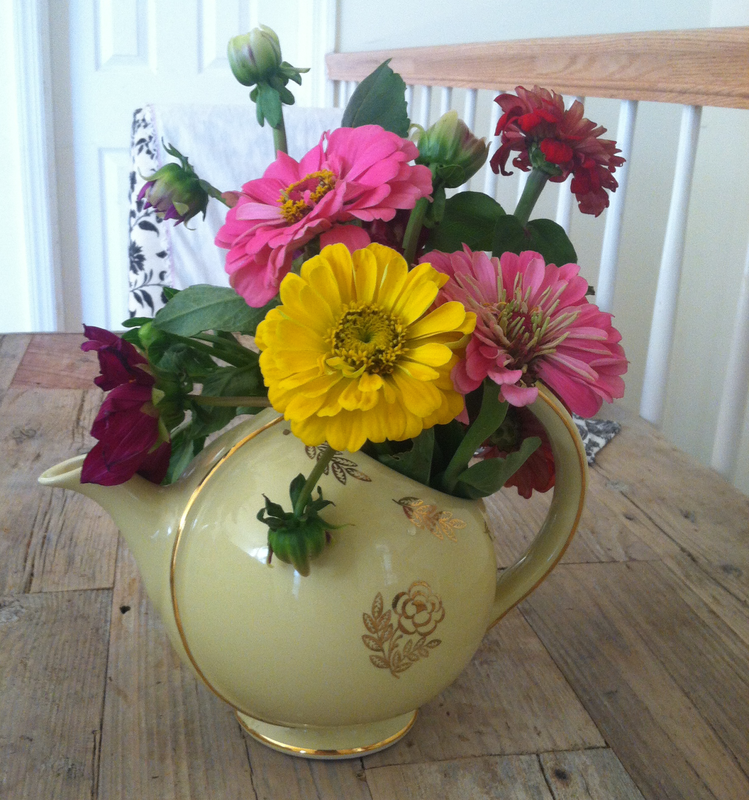 Back to the teapot: I love its bright, cheerful vibe. It’s a natural go-to for me, along with my tiny rose cup (also pictured), which I bought online from Camellia Sinensis’ beautiful selection of tea ware. I’m hardly ever without this cup at home (no one ever drinks from it but me) and I’m currently eyeing this Lethe cup from Marie Serreau. Maybe for Christmas. 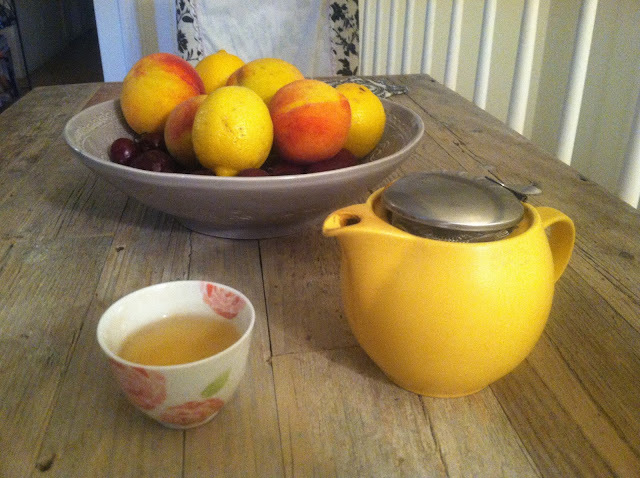 This simple Gaiwan (from my neighborhood tea atelier Bellocq) is my other must-have. I use it a lot, usually when I’m being a bit more mindful about brewing, and really notice the difference when I do. It’s great for serving tea to friends and for regular afternoon breaks. Tea and little snacks are such a great everyday luxury for me—I am very much a grazer—and do tend to pause a few times a day for an oolong and shortbread, chocolate or nuts, even when working from my office at Rockefeller Center. 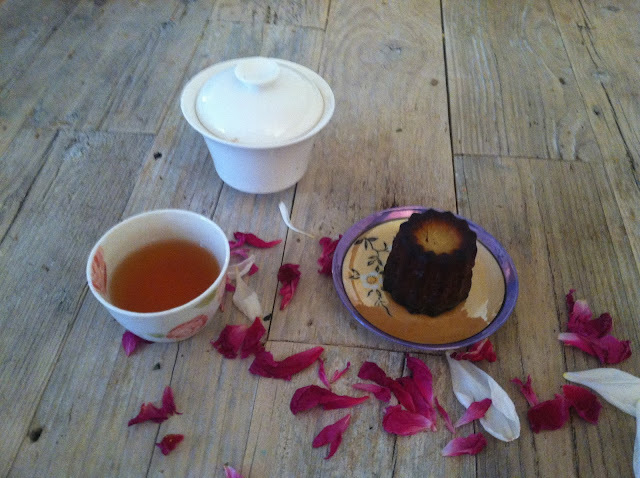 This photo features a canelé I got from Jacques Torres and a Palais des Thés’ Montagne Bleue. I recently finished a series of courses with the World Tea Academy (I’m a tea specialist now and continuing with my studies as a sommelier.) 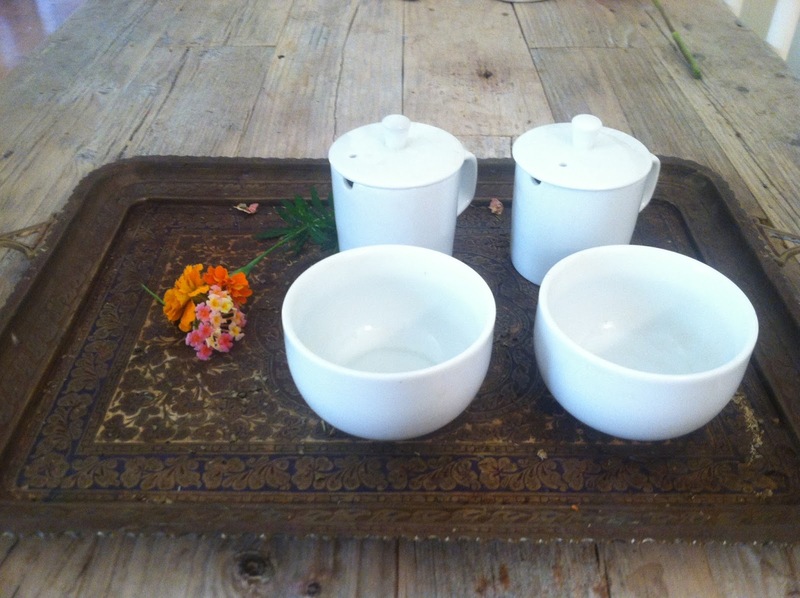 One of my absolute favorite aspects of the program has been tasting teas by doing formal cuppings. Whenever this set comes out, it means I’m about to get serious! (The tray itself is an antique from my husband’s grandmother. I keep it on top of two old chests I have in my bedroom with separate drawers for each kind of tea. And do sometimes think of my room as a tea chamber, like women had in the old days, whereas my husband uses our basement as a man cave to house his extensive whiskey collection.) I enjoy the practice of measuring, focusing purely on tasting and taking actual notes, since I’m often much looser about brewing and tend to go by feeling on most days. I do all of my tastings at my meditation cushion and altar. I don’t drink as much matcha as I used to, despite the recent craze in New York (I went on a major kick several years ago after bringing back a bunch from Kyoto.) 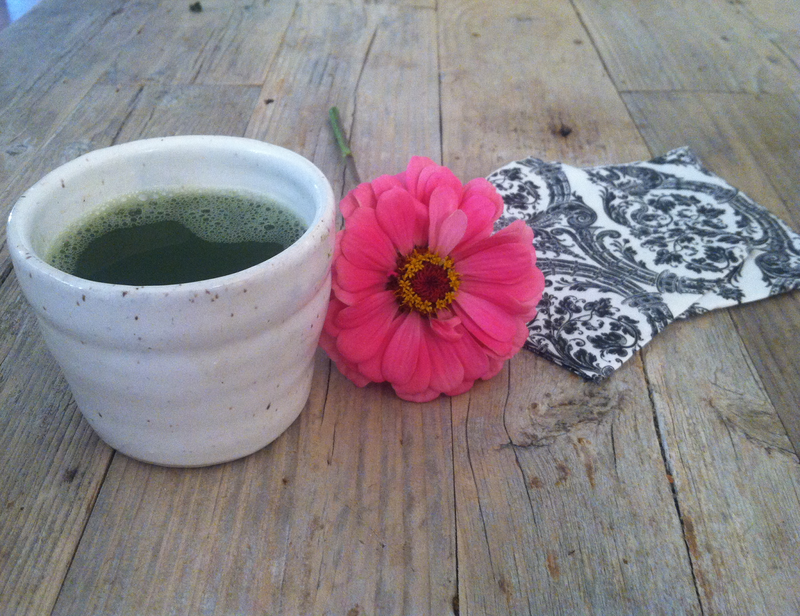 But do sometimes pull out this cup I made at a Mother’s Day pottery class at Choplet studios in Williamsburg. I’m quite proud of it –it’s the perfect size to cradle in your hands. I adore vintage tea ware (from all around the world) and sometimes receive gorgeous teapots from friends and family that I don’t use to brew tea. Like this early twentieth century beauty from the Ohio-based company Hall that’s so lovely as a centerpiece. Just look at that marvelous design! Thank you for sharing your favorite tea objects with us, Rachel. I like the flare of your vintage teapot. All photos and stories provided by Rachel Safko. Want more Favorite Tea Ware? Read about the favorites of Sara Shackett of Tea Happiness, Theresa Wong of T Shop, Jo Johnson of A Gift of Tea, Alexis Siemons of teaspoons & petals, Nicole Martin of Tea for Me Please, and Jee Choe of Oh How Civilized. And stay tuned for more! beautiful! I love all of her picks. So glad to know we share the same cheerful beehouse teapot! I've been eyeing a few Hall teapots online lately. I love the art deco ones! Two strong recommendations for Hall! I should check out the company. Thanks for commenting Sara.